The Credit Union of Georgia is like most small- to mid-sized credit unions: one or two Marketing staffers to handle a huge amount of work. As their Annual Meeting date got closer, they were having a tough time getting the copy going for their Annual Report. Typically there are reports from the Board Chair, President and Supervisory Committee. Credit Union of Georgia also needed a Treasurer’s Report. These reports are generally written for these executives, who then read and approve the copy before being printed. The Chairman’s and President’s reports were the ones needing some support. They had a list of topics to cover, JB Communications Group was already working on the design of the report, so we offered to help create the copy. 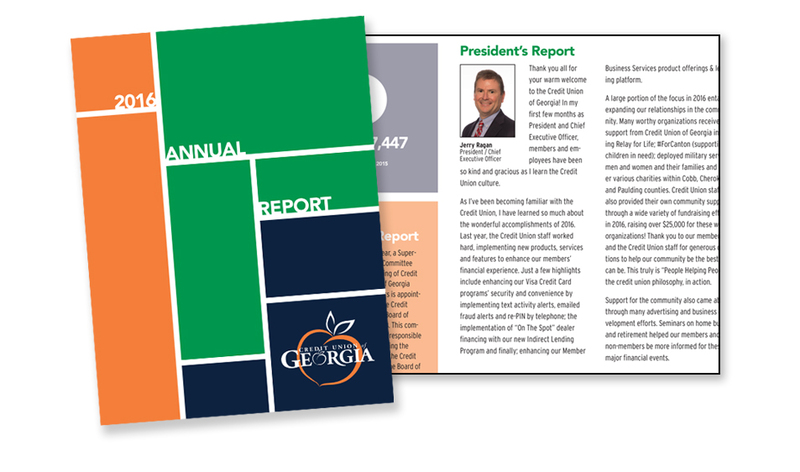 JB Communications Group studied previous Credit Union of Georgia annual reports to get a feel for their voice and style. We also spent time discussing the tone and direction with our contact, the Vice President of Marketing and Business Development. With the research in place, we then got to work writing. Years of working on annual reports for Redstone Federal Credit Union gave us the foundation to swiftly hone in on the important aspects of credit union financials and what credit union members are wanting to learn. The design phase followed the same path, which included research (reviewing previous annual reports and current marketing collateral) and refining tone and direction. The client received several cover concepts and once she decided on the cover art, we applied that design to the rest of the piece. Our writing and design hit the mark! By working closely with the client in the beginning, we saved time and reduced stress during the review process. Very few edits were needed to copy or design! We were also able to take care of the printing and delivery for them – another item deleted from their task list. The Board of Directors raved about the Annual Report, earning the Vice President of Marketing and Business Development high praise.